I have a major problem with gripping my club, I tend to turn my wrist every time I swing. I’m not sure what I’m doing wrong, but the good thing is it really doesn’t effect my swing. I know I’m not griping my club correctly , but will this effect my game perhaps in the future? and what should I do to correct my problem? Scott Robbins: Angel, even though you probably don’t think your grip is affecting your swing, if you are hitting the ball well, your grip has probably adjusted to compensate for another swing flaw. There are many professional players who have “abnormal” application of the hands to the club. Paul Azinger, Corey Pavin, Fred Couples, Nacy Lopez and Laura Davies are a few. At your age though, I would ask you what your goals are in golf, how hard you are willing to work and are you prepared to go through a few tough times for a bushel of better times on the course down the road. If all your answers are positive, then I suggest you visit a PGA Professional for a swing evaluation and what your grip is compensating for. Good Luck! I have trouble getting out of the sand and onto the green from 30-150 yards. What should I do? Scott Robbins: Mike, thanks for your question. The long bunker shot is one of the most difficult in golf. The best way I ever heard it described was by Tom Kite when we used to discuss it at Horseshoe Bay C.C. in Marble Falls, Texas in 1977. Tom said the easiest way to hit that shot was to grip down on the club the same amount you dug your feet in the ground, play the ball slightly back in your stance and as Tom said “hit it as hard as you can.” What you are actually doing is trying to take little or no sand to hit the shot to the green. 4) Hit the ball first and hard. Why do juniors have to play in the championship flight in state events. My handicap is 6. Scott Robbins: Brian, Thanks for your inquiry. Different states and golf associations set their requirements for their competitions. Unfortunately I cannot answer for the golf association for the state of Colorado. However, I bet if you contacted someone with the governing body for the state of Colorado, you will get an answer. Good luck and keep working on your game and enter all those tournaments and win the championship flight! Scott Robbins: Thanks for your question. First, I want you to know you already halfway to a good golf swing. Once you star hooking the ball, it is an easier correction than a slice. Excessive hooks come from a couple of places. First, the clubface at impact is closed (looking to the left). Check the clubface at address. The leading edge of the club should make a “T” with your intended target line. Secondly, check your hands. They should be in a palm to palm position (like you are praying) and the back of your left hand should be parallel with the clubface. At impact your hands should duplicate the address position to keep the club looking at the target. There are many reasons. Find the cause. Check clubface and grip first, path and Swing Plane second. Go see your local PGA Professional to get a well trained eye to find the cause and suggest a cure. I am 45 years old and was an Officer in the Military. I have worked for over 20 years in the for a defense contractor managing property. My goal has always been to become a member of the PGA. I just recently passed the PAT. I do not work in the golf arena, i.e. at a course or shop etc. How does one go about finding out about local jobs so that I can get into a starting position and start my training ? And what kind of salaries/hours do the apprentices start at ? Also is there any way to start the training without being employed in the golf industry ? I know probably not. Also if I were to work as an apprentice, could this be done on weekends or is it a mandatory to work full time ? I have been playing golf for 32 years and also have an AA in Business Administration I am also a graduate of the California Military Academy and Ft. Benning Basic Officer Training Course…does the AA and Military training count for anything with respect to the training required under the PGA course of instruction ? Thanks for any information. Scott Robbins: Congratulations on passing your P.A.T. and the desire to become a PGA Member. The road is long and hard, low pay at first but well worth it if you love the game and want to give something back. The best place to get information is from your local PGA Section. Unfamiliar with Lancaster, I am unsure if Lancaster is in the Northern or Southern California Section. Check with a local PGA Professional to find out. From the section you can obtain all the info you need, especially job openings for apprentices. The PGA of America is also online at www.pgaonline.com and can give you more info about the PGM program. Scott Robbins: Justin, that is a great question. Backspin comes from the amount of clubhead speed you can generate. The more spin you generate, the more backspin, the higher the ball flies and the softer the landing. Many people think they have to create the spin. The spin comes from good fundamentals creating a sweeping motion of the clubhead through impact. I am unsure how old you are, but as you do get older and can create more momentum in your swing that creates speed and you will start stopping the ball at will. See your local PGA Professional for a lesson and have him help you create the swing your are looking for. Scott Robbins: That’s a great question. One of the most difficult shots is hitting a lofted (sand or lob) wedge off of hard, tight fairways because of the bottom or the sole of the club. All sand and lob wedges have a curved sole. That is the ‘bounce’ of the golf club. What I suspect is happening is that you are allowing the club to “bounce” on the hard fairways and that bounces the leading edge of the club into the ball, producing low flying shots or grounders. Good luck with the shot. If you have any problems go see one of the PGA professionals in Amarillo. And also, Happy Birthday!! Scott Robbins: Golf is a game of never ending continual learning process. No, I would not worry that your 13 year old son has a tendency to overswing under pressure. Consider that normal. One of the things the tour professional learns is how to deal with the adrenaline rushes that “pump” them up and make them hit their shots farther than they knew they could. Let experience and coaching solve this “potential problem” in it’s own good time. 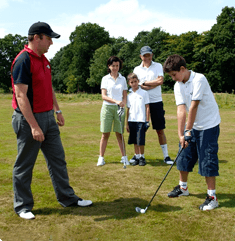 Continue to encourage your son to have fun playing golf and provide him the coaching he needs. In San Antonio there are a great number of PGA professionals with a wealth of knowledge on the golf swing and experiences in playing the game that can help your son as he matures in his golf. I’ll be glad to suggest some of the ones I know personally if you are interested. I want to learn more about golf strategy and the mental side of golf. Are there any books or websites that you recommend? Scott Robbins: What a great question!!!! It is encouraging to hear that you understand that there is so much more to Golf than the swing and chipping and putting. There are a lot of books and tapes on the mental side of the game. Most deal with preparing your mind to play and how to mentally treat the game as you play. Some of the great sports psychologists that have books and or tapes out are: Dr. Richard Coop, Dr. Bob Rotella and my favorite, Dr. David Cook. All these authors can give you some great perspective on playing the game and its place in your life. Currently, I cannot recall any books on playing strategy per se. I will research that a little farther for you. One book that comes to mind is Golf My Way by Jack Nicklaus. Not only does it talk about swing technique but it does have some playing thoughts as well. Good Luck with your golf game. Hit far and straight, hit fairways and greens, avoid hazards and make some putts! Scott Robbins: Jeremy, you have what we call a “push.” A push is a shot that flies to the right with little to no curve. A push is caused usually by too much of an “inside to out” downswing where the club gets to the ball after your body does. Good luck with these suggestions. If this doesn’t work, seek your local PGA professional for suggestions on your swing and equipment. There is never a need to apologize for wanting to improve your golf game or anything in your life. Good Luck! I keep pulling my putts to the left. I play right handed golf. Everything else is fine. Thanks. Scott Robbins: Shawn, Thanks for writing. Pulling putts to the left is usually a sign of a breakdown of the left hand at impact. The left wrist cups and the right hand closes the face. There are a couple of things to try. First be sure your follow through is the same length as your backswing. Put some tees in the ground when you are practicing. One tee at the ball, and the other tees are equidistant from it. Practice making sure the putter travels to both tees during your stroke. Be sure and check your grip on the putter so that the back of your left hand is parallel to the clubface. If you have any more problems be sure to visit your PGA Golf Professional to have him or her check your mechanics.